This website is dedicated to all those young players, Coach’s and Manager’s (& the Parents) that have been involved with the Northern Roller Mills Rugby Tournament since the first tournament in 1925. Whats so special about this tournament, has to be the history. 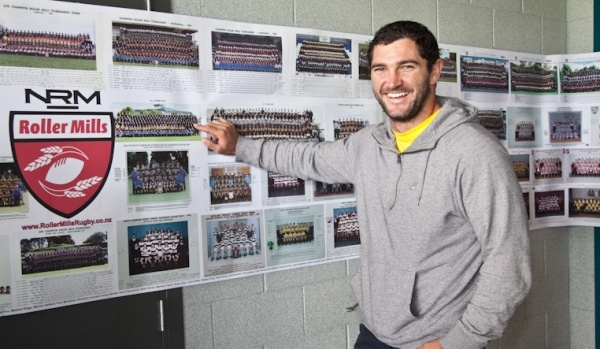 Some unions have their own tournaments such as the Gwynne Shield (Waikato 1921), Tai Mitchell (Bay of Plenty 1938), Taniwha Cup (Northland 1933) which only the top players competing in these local tournaments are selected to represent their union in the Northern Roller Mills Tournament, Add in the Northern Roller Mills (1925) and these tournaments are some of the world’s oldest Junior rugby tournaments. It started when in 1924 the Northern Roller Milling Company (then a Flour Company) located in Fort Street in Auckland presented the Shield for competition between primary school teams from any rugby unions within the Auckland province.The first Tournament was held in Auckland in 1925 with the following teams competing Auckland, Franklin, Tauranga, King Country, Hamilton, Whangarei & Goldfields (Auckland Star 1925). What you’ll see if you attend one of these games is a bunch of very skilful 12-13 yr olds, proudly wearing their union colours, these are no names, they play the game that they love, it’s bred into them from the generations before them…..these are our future. Here they will experience the hardest rugby in there young careers and take away a lot of memories that the likes of Grant Fox, Colin Meads, Michael Jones, Stephen Donald etc. still talk about it today as if it was yesterday. The competition is tough, 4 Points are awarded for a win, bonus point if scored more than 4 tries, 2 points for a draw, 1 point for the losing team if within 7 points. It is a week long tournament and each union plays a pool round of 4 games trying to make the top 2 to play in the finals on Friday and Saturday. 6 games over 7 days with 1 bye day. *The 2005 North Harbour team lost ONLY one game and ended up in 5th position. 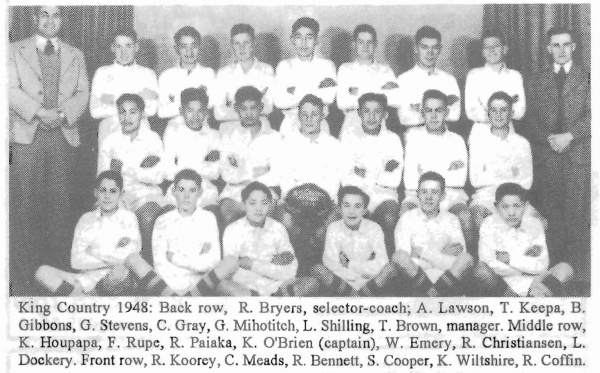 Another Famous ALL Black, Colin Meads, King Country 1948 Roller Mills Team.